Rita Wallace has been teaching in Anami’s Children’s House I for 12 years. She and her husband Frankie are parents of Lucia, 14, (a graduate of Anami), Sofie, 10, and Mia, 4—the younger two enrolled at Anami. In her away-from-school time, Rita enjoys attending multi-cultural events with her family. Being in the classroom everyday with the children gives me the exciting opportunity to witness many wonderful moments in their development. One of these that I particularly enjoy is seeing the face of a child after he or she has been struggling on a particular task—and is finally able to do it. Their eyes light up at that moment of pure joy and accom-plishment! The child says, “I did it, I did it!” For me, that moment never gets old—no matter how many times I witness it. From an early age, children’s search for independence manifests as a strong desire to make things happen in their world and to feel competent doing them. They have a strong urge to do things all by themselves. The young child’s opinion about what they are capable of doing is in large measure a reflection of the parents’ expectations of the child and their responses to his/her attempts. 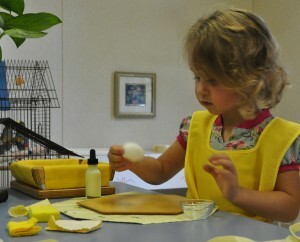 As parents, our role certainly includes support and encouragement of exploration and curiosity and teaching skills. It also includes allowing the child to make appropriate choices. As parents we need to create opportunities for the child to reach independence and take care that we not become the obstacle of joyful moments of accomplishment, big or small. If, as parents, we celebrate with our children these joyful moments that are born from struggle, it will help them become healthier and more independent human beings. It is crucial that we allow the child to deal with small doses of frustration and let them make mistakes before coming to the rescue. An important lesson for adults is that we not intervene too soon, lest the child will not learn to deal with frustration and may even stop trying altogether. Just as it is necessary to establish limits and maintain firm rules about important issues, it is equally important, when possible, to honor the child’s choice to do something him/ herself.